There are four categories: 2D, 3D, Photography/Digital Media, and Poetry. Complete the entry form and upload a photo of your art at www.pbrart.com. 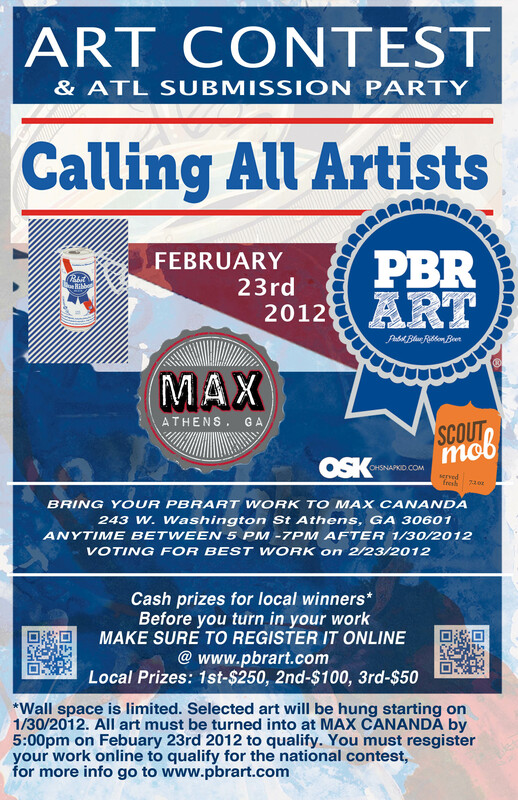 AS A BONUS, YOU MAY ALSO PARTICIPATE IN THIS LOCAL PBRart CONTEST on February 23rd 2012 in Athens at the Max. Submit your art by March 31, 2012 online to possible win cash, schwag, and fame. Local Athens prizes will only be available for artist who chose to bring in work for public display between January 30th 2012 – Febuary 23th, 2012. Entry is completely free and open to anyone over the the age of 21. Be constructed of, inspired by or capture the essence of the Pabst brand/logo. You must upload your entries to participate in the local submission party. Uploaded entries cannot exceed 2MB. All files must be the entrant’s original work. Please forward this info to all interested parties. This entry was written by pbratlanta and posted on February 14, 2012 at 12:59 pm and filed under Art, Events. Bookmark the permalink. Follow any comments here with the RSS feed for this post. Trackbacks are closed, but you can post a comment.